It started off with parents who wanted to give their three children somewhere they could expend their energy. 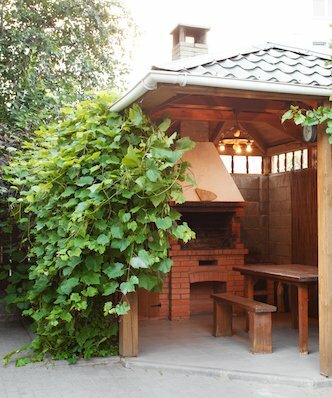 With an impressive Beech Tree in their garden, it was no wonder they came to Gardenatics for help. 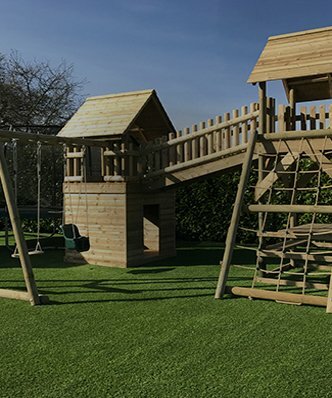 When we saw it, we just had to find a way of creating a triple tree house to incorporate this garden beauty. 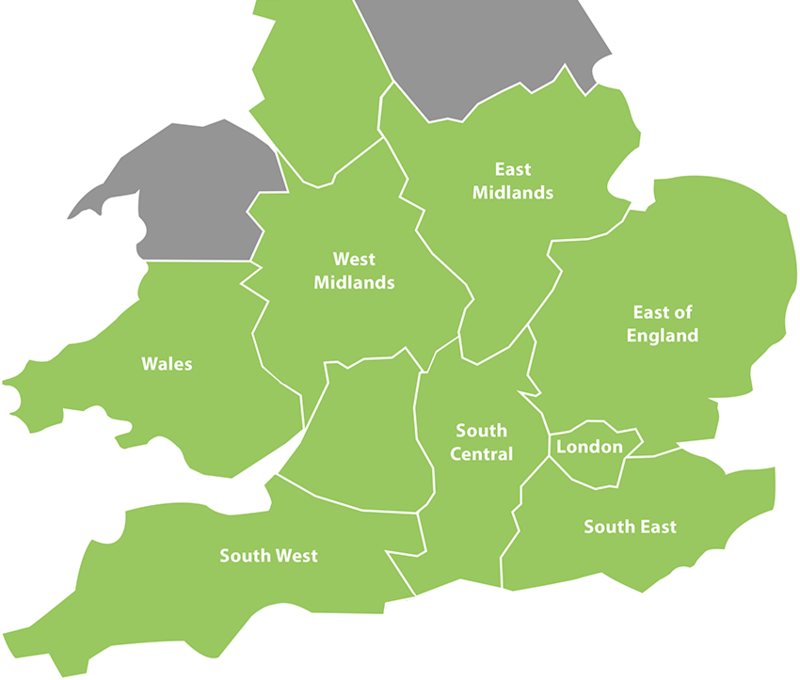 The first challenge was the location of the build. Letchworth is well known for being a tree conservation area, so we had to make sure the heritage society hadn’t protected the tree. After getting the all clear, we still wanted to be sure that we wouldn’t damage the tree roots. So we came up with a clever, cantilever solution. The platform sits near the trunk, but the legs supports are actually further back giving the roots space to grow and to ensure the continued health of the tree. 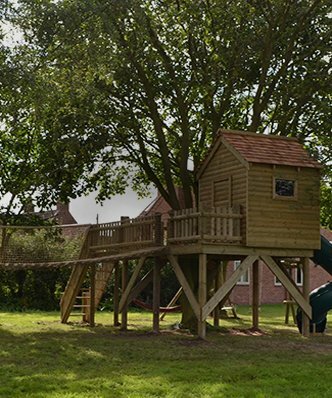 The most striking feature of the build is the big play house, sat up in the branches of the tree. Waney Edge cladding creates a real rustic feel which blends into the rural garden perfectly. The loglap roof, with initials hand-carved into it, adds a personal touch as well as the Flag Pole. The kids personalised the build by designing the emblem for their tree house. However the sheer size of this play house makes it a centre point for fun. It stores all of their favourite outdoor toys, and is ideal for sleep outs under the stars. Memories are made in places such as this: bonds made between family and friends in this escapist paradise. 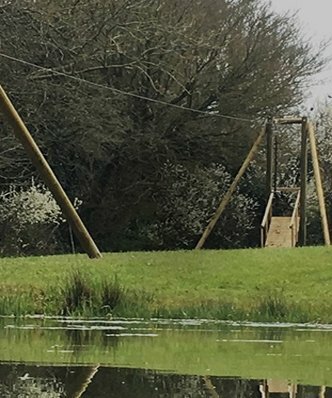 There is a rope swing using one of the thick hanging branches of the tree, children (and big children too) can take a run and jump, soar through the air, from one platform to the other. Watch out for the ‘crocodile infested waters’ as you holler like a modern Tarzan, or even Tarzanita. To entertain all ages, we incorporated more challenging play elements, to test their strength and agility. The rope ‘V’ bridge, which connects the first two platforms, creates a wobbly walkway. It is bound to slow down any child, as they concentrate on getting their footing right over the narrow rope. But knowing kids, they will of course make it even more difficult for each other, swaying can put anyone off their balance. 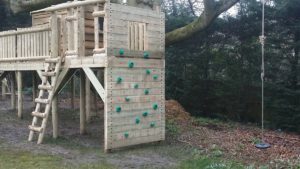 The cargo net and climbing wall develop strength and hand eye coordination, as children work to find what the best route to the top may be, and then the most difficult. They can even race to see who can get to the to the house first: climbing their way up the net or wall, swing or wobble their way to the central platform and whoever gets inside first wins! 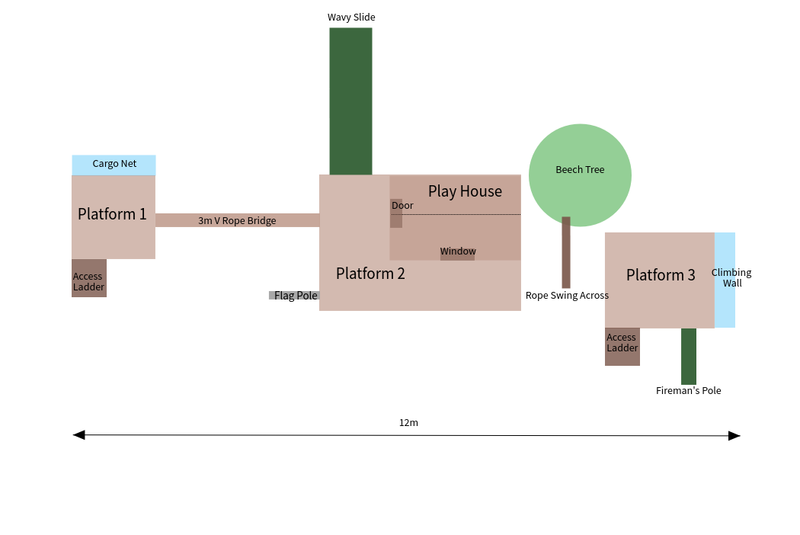 There are ample ways to play and creating a tree house obstacle course is a great place to start. However to double the fun of climbing up something, is to enjoy the journey back down again. That is why the build also features two great slides. First they have the wavy slide, which as the name suggests, has a few bumps along the way, but these only add to increasing the speed and creating an enjoyable ride. Or they can play at Firemen, using the four metre pole to exit swiftly from the platform. Going on to save the day with whatever scenario they create. 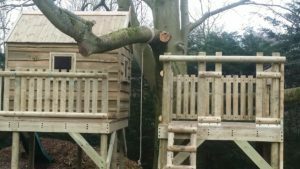 With a large variety of play accessories that both challenge and excite the kids, this family has a tree house that they will love for the years to come whilst they grow up. What’s more they can share this space with friends and family and create memories that will last a lifetime. 6 weeks from order to install. 10 days to install.